Welcome to Springbrook Park, a 52-acre urban nature area in the Uplands neighborhood, dedicated to the enjoyment of all residents and visitors to Lake Oswego. Trails (map) meander beneath canopies of big-leaf maple and red alder, through the native plants, trees and wetlands which shelter trilliums, towhees and small wildlife. Two miles of park trails have been upgraded to meet Oregon State Parks standards. These trails connect surrounding neighborhoods, schools and the Indoor Tennis Center. 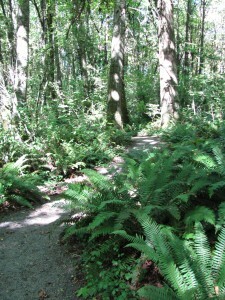 This beautiful natural forest borders Uplands Elementary and Lake Oswego Junior High Schools and serves as an outdoor classroom for students. 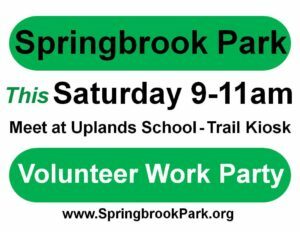 Friends of Springbrook Park provides ongoing preservation and protection services in partnership with the Uplands Neighborhood Association, the schools, and the City of Lake Oswego Parks & Recreation Department, which manages and maintains the park. Along with the Parks and Recreation Department, Friends organizes volunteers to remove invasive plants, restore and replant cleared areas, and improve and maintain trails. Please join us when you see this sign. For our Volunteer Work Parties we will be placing new signs around Uplands Neighborhood.